High resolution image of the somatic basal bodies along the sides of the cytoproct ridge have bundles of microtubules extending into the endoplasm from near their proximal ends. These bundles make contact with the spent vacuole and aid its movement to the cytoproct. 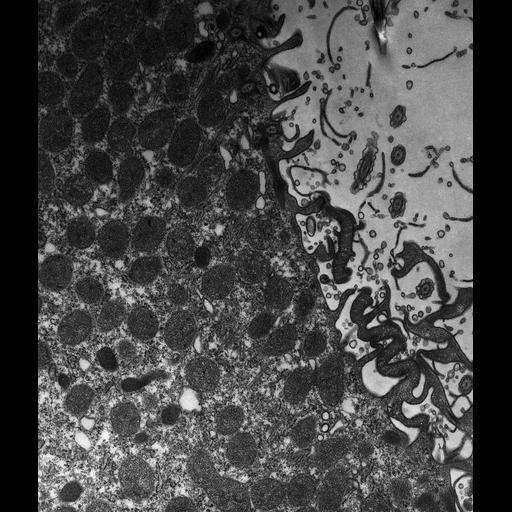 The plasma membrane and alveolar sacs were ruptured in this cell during preparation for electron microscopy. TEM taken on 6/13/79 by R. Allen with Hitachi HU11A operating at 75kV. Neg. 10,000X. The raw film was scanned with an Epson Perfection V750 Pro. This image is best used for quantitative analysis. Standard glutaraldehyde fixation followed by osmium tetroxide, dehydrated in alcohol and embedded in an epoxy resin. Microtome sections prepared at approximately 75nm thickness. Additional information available at (http://www5.pbrc.hawaii.edu/allen/).